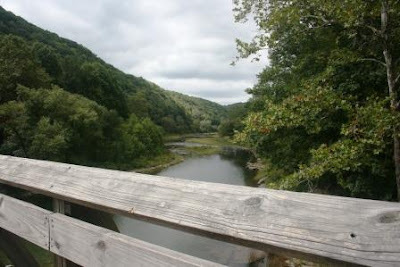 On the last day of our trip to Seneca Forest State Park, WV, we decided we had to check out the Greenbrier River Trail, one of those converted old railroad trails. We got directions to drive to Sharp's tunnel, which involved some hairy roads, made all the hairier by an emergency little boy bathroom situation! But we finally made it to our destination. Sharp's Tunnel was built in 1900 and is 511 feet long. We brought headlamps, which is good because it was pitch black once you got in the middle of it. Paul hung out with the boys so I could go on a run. It was a crisp morning for it, and I put in 6 of the most beautiful running miles I've seen in ages. Not a soul on the trail, the smell of fall leaves in the air, and a deer with her twin babies that watched me run by. 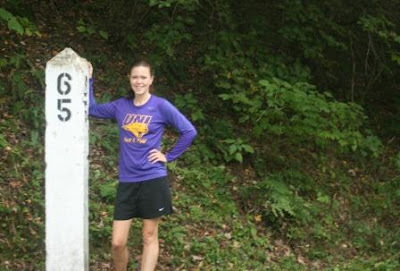 I ran from mile marker 65 to 68 and back. 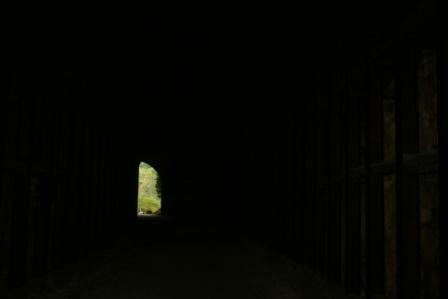 On the way back through the tunnel, I didn't use a headlamp but just went by feel. Kind of strange trusting my feet in the pitch blackness. Pierce took both of these pictures of me while we hung out waiting for Paul to take his turn with a run. Like the shirt? 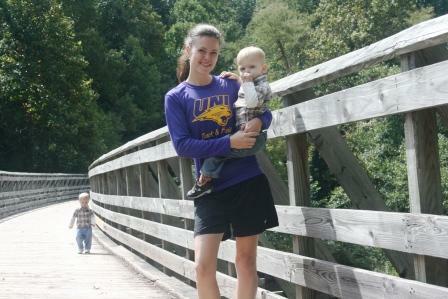 I didn't run track for UNI but my friend Shelli coaches there, and gave me the fun running shirt. Gorgeous bit of trail by the river, isn't it? When's the last time a view took your breath away? The winner of the $40 gift certificate to Milk Nursingwear was Deanna Menyes. Thanks so much to all who entered! How cool to get to use headlamps! The trail really looks wonderful! What a great trip! 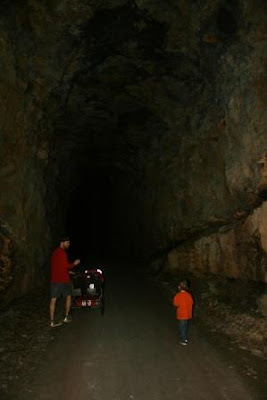 I would've been a little freaked out by the tunnel sans headlamp, though! Pierce did a good job with those two photos! Gorgeous! How cool that you got a run in, and through the tunnel! That would be really scary in that tunnel. I'd be afraid of bats! pierce did great with the camera! wow! neat that you could both enjoy some great fresh air and exercise while there! gorgeous family photo, that's the best, when everyone is in the picture!! these are great.....i love trains and tunnels, i love everything!! looks/sounds like a great trip!! How green it is. I forget since I live in the desert. Twin babies is fairly rare so what a sight that must have been. 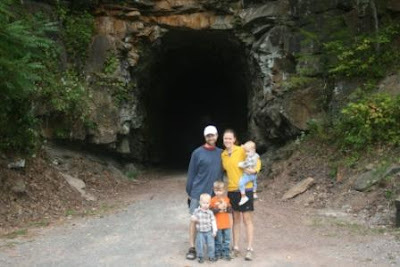 I've biked through long tunnels, but never run. I think it'd be a little scary to run without any sight! So fun. What a great tunnel! You gotta love a pretty view and some fresh air. What a beautiful place to have your run. I love checking out different places, Hubs on the other hand,.. doesn't. Pierce did a great job taking the pictures of you. You really are quite an athlete, I admit that I'm jealous. I can barely go a block with a cane. But I can root for you! I cannot IMAGINE how you made it through the tunnel with no light!!!! Would have been a bit too spooky for me. Pierce is a good photographer! I always love coming here, I never know what your next adventure will be! Your scenery is beautiful and I think it has been awhile since I've gone on a trip and looked around to be honest - I need to do that! Pierce is quite a good photographer! Yay on the 6 mile run. Sounds fun. That is soooo cool! My boys would love that! How'd your boys feel in the middle of the tunnel? Love how you worked it out so you could both run and everyone could have a really great day. You are awesome. This will give you a good laugh! I have no idea where you were at and you know I live in West Virginia! lol It's funny to learn something about my state from someone who doesn't live here. At least I learned something new! The tunnel looks neat. West Virginia does have some very beautiful views! I agree what a great trip and it looks like such an awesome place!! The scenery is gorgeous! I would not have liked coming back through the tunnel in the dark. Did I ever tell you that my daughter took a summer college class a year ago at a sustainable farm in WV? She said the mountains were beautiful (the ones that had not been blown to bits by the coal companies) and she fell in love with the people she worked with. Beautiful! Your run sounds incredible. I worked on Mt. Rainier one summer and would run about 5 miles a few times a week up in the mountains. I loved the fresh air. Aaahhh, I love trail running! Somehow I can't stand the road running anymore - so it's all trail now.